Love them or loathe them, they’re coming to a café near you. Over the years, we’ve been blessed (?) with the likes of smashed avo, coffee in a cone, unicorn bowls, sushi donuts and micro tapas (what is this, tapas for ants?). Most of these foreign trends have earned permanent residency across Australian eateries, and we’re pretty darn curious to take a sneak peek into what to expect across future hype meals. Will they stay? Will they go? We don’t know. But, we’ve rounded up food trends to keep your hungry eyes on. A burger with cheese, coated in melted cheese… please. Videos have been surfacing of an overseas diner that dips the heck out of everything on the menu in thick, melted cheese. 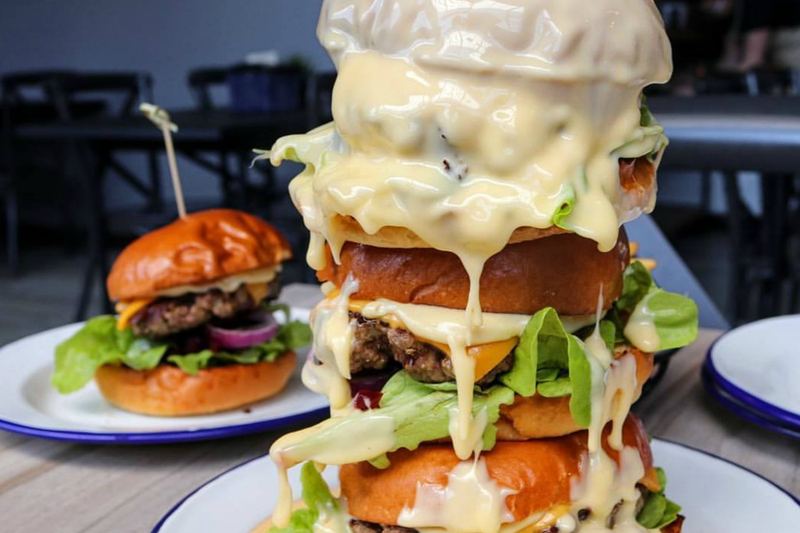 We can hear Sydney residents going “ugh, that is so March 2018 at Burger Point” – and you’re right, but we’re talking EVERYTHING DIPPED IN COW JUICE. No future fries, wraps, salads or desserts are safe from a cheesening – and neither is anyone in the path of a lactose intolerant being that likes to live life on the edge. Who would win in a fight between a coffee snob and a tea snob? Apparently it would be a pretty fair battle, as the tea loving population is reaching new heights. Whether it’s bubble tea, chai, matcha, cheese tea or a humble cup of English Breakfast – people are doing more than a cheeky stop and sip the sample at T2. All tea, all the health benefits, no shade. Don’t swat away that fly, it’ll go great with your lunch. Earlier this year, the University of Queensland had a visit from The Economist, the connoisseurs of insect ice cream (!!!!????). Not for the faint of heart, combinations including grasshopper and chocolate, and strawberry swirls with cream and meal-worms very much happened, and were very much eaten. If you prefer your ants in a savoury dish, Detour serves salmon with sesame, wakame and black ants. What’s next? Tarantula tacos? We don’t know, and frankly, we don’t want to know. In wholesome news, plant-based dining is sweeping over the nation, making it easier for you and your vegan mates to head out without a head of lettuce being the only option. Places such as Lord of The Fries, Yavanna and The Green Edge (which is also a vegan supermarket, you’re welcome) are whipping up classic favourites you know and love, minus the animal bits – with more and more people are joining in on the gorgeous movement! Don’t have a cow, man. Plastic straws are frowned upon pretty much everywhere you go. You can either sip it raw, grab a metal straw… or tackle the option of a futuristic edible straw! So far we’ve seen this pop up at Salt Meats Cheese, who offer hollow spaghetti for your drinking pleasure. We’d love to see this catch on in other forms. Dessert straws maybe? Here’s to hoping. - the gourmand who is seriously offended by micro tapas. The new health food trend everyone’s talking about!